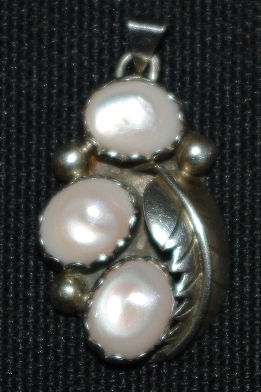 I have a sterling and mother of pearl slide pendant (see photo below) made by Marilyn Chuyate and have been unable to find any info that she ever made jewelry. Her name is stamped on the back of this piece. Do you have any info on this or know how to contact her? If she does not want to be contacted directly you could pass on my info to her. Any help would be greatly appreciated. You may indeed have a unique piece because I have never seen jewelry made by Marilyn Chuyate (Quam). She is a Zuni artist most noted for her darling small fetish carvings: bears, turtles, horses. First a little bit about her name. Her family name is Marilyn Chuyate; she is sister to Octavius Chuyate, also a Zuni carver. Both she and her brother are mentioned and their work shown in Zuni Fetishes and Carvings by Kent McMannis. Eldred’s entire family tree is included in the above mentioned book. Her husband Eldred Quam is the son of Rosalia Quam and Andrew Emerson Quam, both former carvers, both deceased. Rosalia was noted for stringing bird fetishes and for her fetish horses, inlaid frogs, and owls. Andrew Emerson was noted for his bird necklaces. Rosalia and Andrew taught their children the carving craft which included Eldred Quam, Marilyn’s husband. We’ve had several of Mairlyn Chuyate Quam’s fetishes in our store – just to give you an example – all were signed with all three of her intitials. So I would guess the pendant you have was made before she married since it uses only her family name. It has a vintage and very handmade look to it. The leaf looks handmade and the bezels which hold the Mother of Pearl look hand cut. A very nice piece and something you should treasure. I have no specific personal contact information but a good place to always start is Zuni, New Mexico.